Winter is officially here… the weather in Melbourne has been crisp but deliciously sunny – the leaves are still falling and the air is misty. Couldn’t resist buying a bunch of the first white jonquils to appear and am loving their heady perfume. 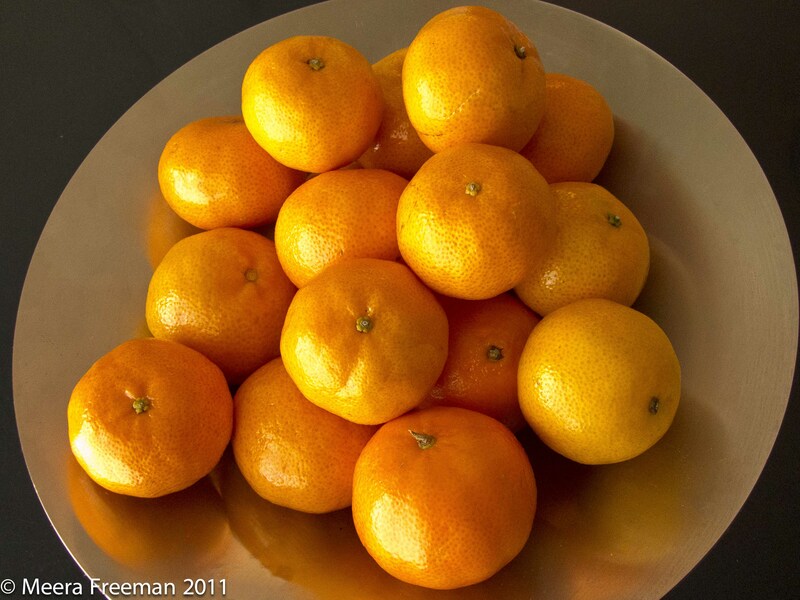 Piles of shiny mandarins are in all the fruit shops and markets, golden, fragrant and juicy. Time to make the first Mandarin Sorbet of the season. My take on sorbets is that they should taste more like the fruit than the fruit itself… with that third dimension that I like to call the IMAX effect… ! Adding an alcohol made from the same fruit used to make the sorbet gives it a depth and smooth texture that is otherwise hard to achieve without adding too much sugar and making it oversweet. An ice cream churn is a must to get the smooth, ice free texture that makes your sorbet so perfect – I’ve had my trusty Simac Il Gelataio for nearly 30 years. (It’s a huge monster but I wouldn’t be without it… the results are perfect every time and it has only needed a service twice since I’ve owned it.) It lives on a shelf in my pantry and never comes out except for spring cleaning. Several types of mandarins appear as the season progresses but only the Imperial variety is fragrant enough for making sorbet with a flavour to make you swoon. Combine all the ingredients in a jug and chill. Taste for sugar and acidity adding more syrup or lemon juice if needed. Churn until smooth. Transfer to a container and freeze for a few hours to let the flavours develop. A little salad of fresh mandarin segments tossed in a tbsp sugar syrup and a tsp Mandarin Napoleon is a lovely accompaniment. Looks absolutely beautiful Meera – I may have to try this one when I next throw a dinner party. You must, while they are in season… probably one of the best flavours that exist!! I am going to make this on the weekend. I am loving the mandarins at the moment. I will let you know how it goes. Thanks for the recipe! 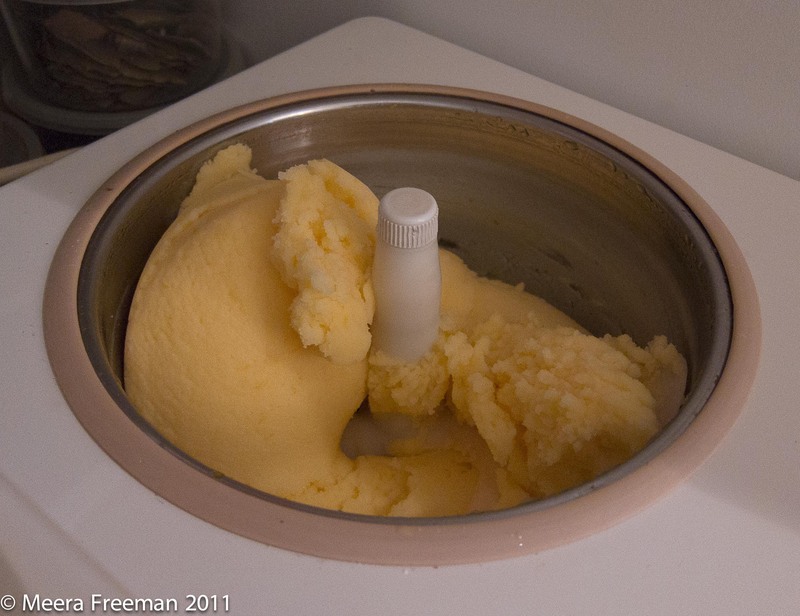 I tried to make your sorbet recipe but during churning, the mixture would never get smooth, no matter how long. Is there any advice on how can I get it smooth? Do you have a churn with a motor or one which has a container that is chilled in the freezer? but if your churn is not very good, try reducing the amount of alcohol and see how you go. Have been making this sorbet for over 30 years and have never had a problem. I do, however, use a self chilling churn with a powerful motor…. let me know how you go.